Larry Lessig’s Code and other Laws of Cyberspace of remains one of the most important books written about how software impacts law. Lessing and other academics have shown how code has fundamentally changed copyright law. The design of technology, especially software, changes the nature of regulation and enforcement of laws. My academic work is in part about applying the insights of Lessig and others to enterprise software. I have a habit of seeking out weird metaphors to explain things, sometimes in a long, convoluted fashion. Readers of this blog will know that I am a fan of cricket. Today, I have SA v India and Australia v England on in the background. Law 36 is the leg before wicket law (LBW) in cricket. Here is the law, explained brilliantly by the brilliant Stephen Fry. 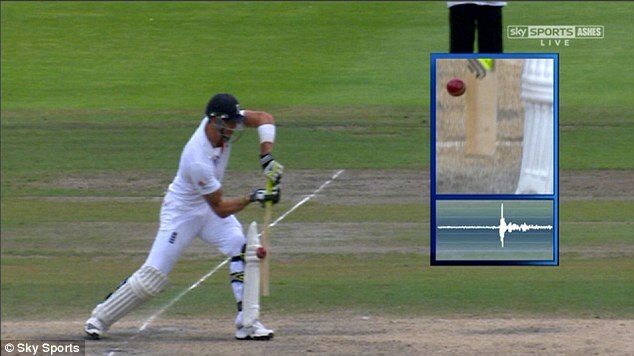 Over the last few years technology has come to play an ever more significant role in determining the LBW decision. I’m generally a fan of DRS, the Decision Review System. There are a variety of technologies in use today. Slow motion review, infra red cameras, edge detection and ball tracking. In many cases, it has made decision making fairer, and it adds to the fan experience. But DRS is not without controversy. Ball tracking example. from DRS website. It is not always clear with edge detection technology as to whether sound is from the ball hitting the bat, or from the pad or clothing noise. (for more on the acoustic theory, and how edge detection could be improved, see this post) and this paper. There are different technologies in place around the world, and these work differently. the parameters of the same software are set up differently in different countries. Back to the metaphor, and some observations. Code has partly replaced the umpire as the arbiter of the LBW decision. The programmer who codes the algorithm is now umpire. Code is Law 36. Code creates an aura of infallibility that is not always earned. The algorithms are model representations of the real world, not the real world. It is a black box and unless you have an advanced degree in physics, impossible to understand or challenge. The fact that the technology is improving, by definition means that is still not infallible. Consistent procedures around the code’s deployment are important in determining perceptions of procedural fairness. Standards, consistently applied, are key. People are willing to abdicate to code, provided that they perceive that the code and supporting procedures act consistently. Making judgements with the input of technology takes practice, especially where the decision is not clear cut. For instance, interpreting sound wave curves requires training. The technology can change faster than the law can adapt to it. The use of the technology has changed the game. How batsmen respond to spin bowling has changed. The former England captain, Andrew Cook had this to say. As we build code to replace or augment human decision making, we need to hold those building the code and the processes around it to high standards. Jonny Bairstow has a point, when it is wrong, you mess with people’s livelihoods. Law 36 is a fine example of the rather messy place where law and code meet. Author Thomas OtterPosted on January 6, 2018 Categories cricketLeave a comment on Code is law. The case of law 36. I was in Hamburg this week, with my family. My Dad and I were able to go to the the New year’s eve daytime concert at the Elbphilharmonie. That experience will be the subject of another blog post, I’m still processing the majestic marvel that is the Elbphilharmonie. And I’m really impressed by Hamburg. Just before heading up to Hamburg, I pinged Paul Jozefak to see if he could meet up for a coffee. We met up for breakfast, and I’m very glad I did. He is wise beyond his years, and generous with his advice and ideas. We both enjoy cycling and as relatively eingedeutsched ex-pat/immigrants we had similar views on living and working in Germany. Both of us have been here for the best part of 20 years, without really planning to be. Paul’s insight into the state of digitalization and the opportunities that it opens up in German economy is profound, and I have not met many people who understand the big company world, venture capital, and start ups as well as he does. He has an excellent, long running, blog. It was Jeff Nolan who introduced us many years ago, and we stayed in touch via social media. I think this was the first time we had managed to do face to face since then. It reminded me of the Dunbar number and Granovetter’s research on weak ties that I first learnt about from reading JP Rangaswami and Andrew McAfee, if my memory still works correctly. While social media can be time sink, at times it offers up a connection and relationship that makes me realise that it has real utility. That reminds me, it is high time that I meet JP in person too. But rather than breakfast, I hope it is at tea, at the Oval, or Lords, perhaps. Next week is SuccessConnect. I have been to a goodly number of these now. My first one was as an analyst. The event was in Amsterdam. I remember an excellent, if somewhat extended keynote from Lars. I’m looking forward to being on stage with Dave Ragones. Over the last year or so I have learned more about the management part of product management and getting things done from Dave than I have from anyone in my career. James Harvey, our Engineering, Operations and Service Delivery head will join us in the keynote too. We have an awesome line up of customers, and SAP colleagues. And we will be making a special award. The demos will rock, thanks to Abhijit, Martin and Gerald, and the cast supporting them. A special thanks also to Helen Arnold, who now leads the SAP Data Network. We are working on some funky stuff with Helen’s team that we will chat about and show. There is a buzz at SAP about Leonardo, so we will look at how that will benefit SuccessFactors customers. But I don’t want to give it all away here. I will also get to spend time with our new leader of product management and product marketing, Amy Wilson. I have known Amy for years. She helped build the Workday products into a formidable competitor, and having her lead our team will only make us stronger. I’m biased, but I don’t think there is a better product team in the HR Tech industry than the one SAP SuccessFactors has assembled. Welcome Amy. The day one keynote will be led by our own CHRO, Stefan Ries. He is of the staunchest supporters of our product, and he can be our fiercest but fairest critic too. Our partnership with our own HR department has helped make better product. Thanks Stefan and team. His keynote is packed to the brim with customers. With a bit of luck I might even get to say hello to Richard Branson, but that would be a bonus. The rest of the week will be filled with customer meetings. I think I have at least 14 meetings. The names that were prospects last time are live customers now. I get to hear from them what’s working well and what could be better. I’ll get to bump into many other customers and partners too. I’m especially curious to catch up with extension partners like James from Enterprise Jungle. Extensions are going mainstream. sweet. My one disappointment is that I don’t get to see the breakout customer sessions. When customers get up and present what they do with our stuff, and we get to see how the software makes their organisations better, it is the best vindication. My special thanks to those customers like Lionel Safar from Essilor that tell their stories. The real reason I’m going to London though, is to watch the cricket. India v South Africa at the Oval. Now that will be magnificent. Watching De Villiers dispatch Ashwin nonchalantly over the Vauxhall end, or Kohli’s off stump spiral in the air from a quicker Radaba ball will make my day. Seeing my colleague and friend Murali’s face when that happens will make my year. Test Match Sofa. This is what the Internet is for. Regular readers will know that I’m a cricket fan. Being a cricket fan in Germany is awkward, as unless you con the beeb into thinking your computer isn’t in Germany, you can’t get decent audio or video coverage. This post will not be about the dumbness of DRM, but if the BeeB is reading, I will pay handsomely for legal iplayer access to cricket. See my earlier moan here. At the moment the Ashes are on. I never thought I would say this but I’m supporting England this time around. Partly because a good number of the line up have the same accent as I do, but mainly because of testmatchsofa. Testmatchsofa, where Goethe, a bit of swearing, leg breaks, comedy jingles, Chardonnay, Twitter, profound cricket knowledge, more than a smattering women commentators and dodgy South African accent imitations combine for compelling listening. Their show exploits a lot of the web 2.0 technologies and concepts that I discuss and analyze as part of my day job. 1. Creation and broadcast costs are close to zero. 2. Multi-channel delivery. flash, iphone, native web, gadgets etc. 3. Audience participation. The sofa team don’t just use twitter to broadcast messages, they answer questions and chat with their audience. 4. Mashups. The combination of the cricinfo text feed, twitter and the broadcast gives a better experience than radio alone. Sofa works because the gang actually know cricket. They may not have opened the batting for England half a century ago but they know their way around the Wisden, and they love the game. The game of cricket is now thoroughly professional, but is good to see that the cult of the amateur is alive and well beyond the mid-wicket boundary. To the gang at testmatchsofa, keep the commentary coming. Just drop the KP accent imitation, please. Author Thomas OtterPosted on November 26, 2010 Categories cricketTags cricket, testmatchsofa. web 2.02 Comments on Test Match Sofa. This is what the Internet is for. Banging on about HR analytics. Regular readers will know this is one of my regular themes. HR, analytics and a bit of cricket. Tom Davenport, over on his Harvard blog, picks up on how HR could learn from Basketball. How do analytics spread in sports? It usually starts with a few individuals who have seen their application in other domains (Daryl Morey of the Rockets, for example, was a fan of Bill James, the baseball stats Geek of Geeks), and figures they will work in a new context. Some like-minded rich people bankroll the experimentation (in the Rockets’ case, owner Leslie Alexander), and the team starts to perform pretty well (Houston had a 22-game winning streak last year despite injuries to key players). New metrics get developed–both by teams and amateurs outside them. Then other teams catch on. The last time I checked about a year ago, roughly half of NBA teams had statisticians on staff. I wonder how many HR department have statisticians on their staff? 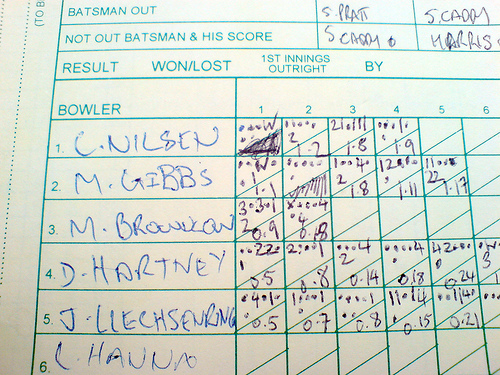 As a boy I wasn’t good enough to be in the cricket team, so I ended up being the scorer. I enjoyed it, and since then I have had an interest in how to measure performance. My German friends think it very odd that I can derive enjoyment from following a text based cricket commentary for 5 days, but anyway. There is beauty in these numbers (unless you are an Australian cricket fan). I’m continuing to focus on HR analytics in my research, I recently did a note on absence management. Absence costs UK organizations 3% of payroll, yet less than 50% of organizations measure or analyse it. Time to train up a few scorers I think. photo from vapours cc flickr. thanks. Author Thomas OtterPosted on February 19, 2009 Categories cricket, HR Technology, HR technology related, IT RelatedTags analytics, cricket, Tom Davenport3 Comments on Banging on about HR analytics. HR, Baseball, Cricket and statistical deviation. If I was to live in America, I would become a baseball fan. I grew up with cricket, so despite my current German domicile, I’m a cricket fan. In many ways the games are different, but both games are bound by the common thread of bat and ball. Also, both games rely on extensive use of numbers and stats to provide both real time and historical data. If one mentioned that England were 34/5 , it would enable me ( or any cricket fan) to make a precise judgement about the state of the game. Several hours of play summarised with 2 numbers. From this one can make some deductions about the wicket, the bowling and the brittle state of the English batting line up. It is this clever use of numbers to create an immediate summary of the game that makes it easy to follow a cricket game while getting on with the rest of your day. 2 seconds on cricinfo brings me up to speed. A test match can last 5 days, but cricket, allows and encourages one to get on with other things while at the same time feeling part of the action. Cricket is the master of continuous partial attention, long before the phrase was invented. As junior schoolboys someone would sneak a radio into class hide it in his desk, and then pass around a scrap of paper with the score on when anything happened. I think the teacher knew what was going on, but as long as play was relatively slow, he didn’t seem to mind. I suppose the modern equivalent of that is the cricinfo applet running on my toolbar, and DRM permitting, the tones of Aggersm Boycott and Blofeld on TMS. I really enjoyed reading Andrew McAfee’s post on baseball statistics and IT competitiveness. Even if you aren’t a baseball fan read it. Full House is a true geek’s book. It combines paleontology, evolution, and baseball statistics to advance an elegant argument: that we humans have a counterproductive tendency to focus on averages and trends over time, rather than on variation around the average. For Gould, variation is where the action is. Image a world where HR people were able to derive as much value and pleasure out of analytics as cricket and baseball fans do. At the moment most HR departments can’t even really keep score. Author Thomas OtterPosted on July 22, 2008 Categories cricket, Finance related, HR Technology, life in generalTags cricket HR analytics mcafee baseball1 Comment on HR, Baseball, Cricket and statistical deviation. I’m a cricket fan, odd that, living in Germany, I know. 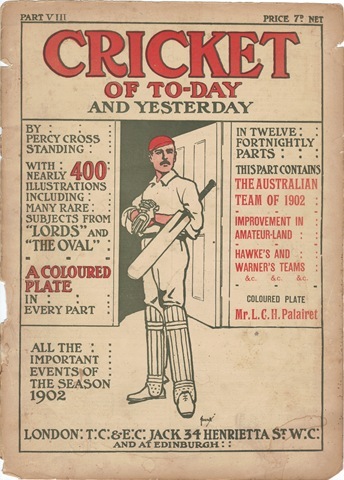 Over the years I’ve picked up various bits of cricket memorabilia including this magazine from 1902, Cricket of Today and Yesterday. Not a lot has really changed, quoting from 1902. This isn’t about the Australian umpire, Darrell Hair. 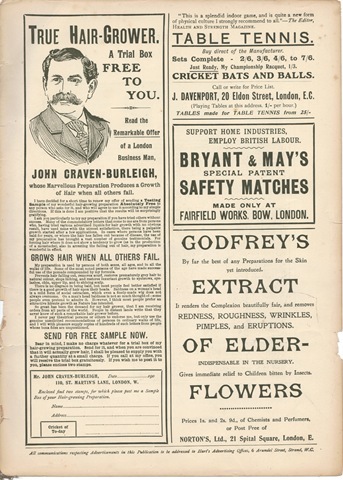 But about cricket’s odd relationship with hair growth advertising. This tradition has continued. Graham Gooch, former England captain became the pinup for Advanced Hair Studios. Actually the fellow in the advert above looks rather a lot like Mr Gooch. It is a pity thegoogly.com has gone into hibernation, as they have a penchant for collecting Gooch look alike images. 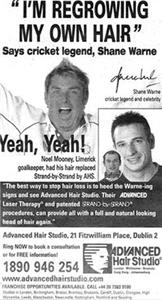 The greatest spin bowler ever, Shane Warne, has also advertised the merits of these hair-growth products. Incidentally, the firm in question, Advanced Hair Studio, has been rebuked by the advertising standards folks about misleading adverts. Not much changes. The Australians are still the best at the game, and we still are on receiving end of meaningless celebrity endorsements.